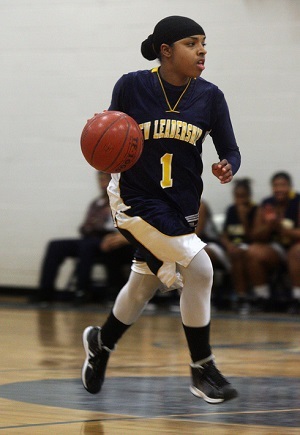 Bilqis Abdul-Qaadir averaged 42 points per game as a high school senior. Bilqis Abdul-Qaadir‘s basketball future is hanging by the threads of a headscarf. The 5-4 guard averaged a team-high 14.2 points as a senior at Indiana State University this past season and was named First Team All-Missouri Valley Conference. She is also the state of Massachusetts’ all-time leading scorer on the high school level (for boys and girls), pouring in 3,070 points during her career at New Leadership Charter School. Abdul-Qaadir wants to play professionally in another country: Spain, Germany, Italy, the Philippines, Israel and Romania top her list of ideal destinations. And with her speed, scoring ability and defensive ball-hawking instincts (1.9 steals per game at ISU) she’s certainly good enough to make somebody’s pro roster somewhere in the world. But Abdul-Qaadir recently found out that the headscarf she has worn on the court for every game since the ninth grade — part of her Muslim hijab that includes covering her arms and legs with long sleeves — is prohibited by FIBA, the sport’s international governing body. Thanks to Article 4.4.2 of the FIBA Official Basketball Rules, Abdul-Qaadir and any other Muslim woman who wants to honor her religion while playing in any FIBA-affiliated international tournament (e.g. the Olympics) or pro league (pretty much every league except the WNBA) could be kept off the court or have their team forfeit games by choosing to break the rule. Which has understandably hurt Abdul-Qaadir’s chances of signing a contract with a pro team. Thank you for your e-mail and request to get a better sense of the official interpretation that FIBA lends to Article 4.4.2 of the FIBA Official Basketball Rules. We understand that your query is with regards to the matter of players wearing Muslim headscarves in official basketball competitions played under the Official Basketball Rules established by FIBA. In this regard, it is worth pointing out that FIBA’s rules and regulations apply on a global scale and make no distinction between the various religions so as to ensure that none of them are being targeted specifically or discriminated against. It is also worth highlighting the fact that Article 1 of FIBA’s General Statutes calls for FIBA to maintain absolute religious neutrality. As such, all FIBA regulations must be interpreted from a purely sports-related point of view, without any religious connotation. Article 4.4.2 of the Official Basketball Rules (please find below an extract of this article) contains a list of objects and equipment/apparel which players shall not wear during an international competition. In this list are all types of headgear and other accessories worn on one’s head. This measure is in place for reasons of safety and uniformity on the basketball court in particular. This article makes provision for only one exception — headbands no wider than 5 centimetres which allow for hair and sweat to be held back in order not to disturb the player. In light of the aforementioned, the wearing of a headscarf — just like any other object or accessory to be worn on the player’s head — is not authorised in an official competition. FIBA has received demands from countries in Asia and the Middle East in particular with a view to change regulations in order to allow women players to wear the hijab or other religious headscarves/clothes (some of them covering the full body). FIBA’s Technical Commission — which deals with requests to make changes to the Official Basketball Rules — has, as of yet, not recommended to FIBA’s Central Board to make any modifications to Article 4.4.2 of the Official Basketball Rules. The FIBA Technical Commission may discuss this matter again at its next Technical Commission meeting. Players shall not wear equipment (objects) that may cause injury to other players. – Finger, hand, wrist, elbow or forearm guards, casts or braces made of leather, plastic, pliable (soft) plastic, metal or any other hard substance, even if covered with soft padding. – Objects that could cut or cause abrasions (fingernails must be closely cut). – Headgear, hair accessories and jewellery. – Headbands, maximum five (5) cm in width, made of non-abrasive, unicolour cloth, pliable plastic or rubber. Personally, I still don’t see how a headscarf — particularly a tightly-wrapped headscarf like Bilqis Abdul-Qaadir and other Muslim female basketball players wear on the court — is any more obtrusive, distracting or prone to causing an injury than the headbands worn by Team USA stars like LeBron James and Candace Parker. The rule is clearly discriminatory in that it realistically only impacts players who would wear headgear for religious reasons: Muslim women wearing hijab, Sikh men wearing patkas/dastars, Jewish men wearing yarmulkes, etc. It’s not like men around the world are trying to wear snapback caps or girls are trying to wear tiaras on the court just for fashion. Do you think Article 4.4.2 should stand? Should players be allowed to wear hijab/headscarves on the basketball court? This is getting ridiculous. How anymore careers are going to go to waste for them to finally lift this discriminatory ban? We should start a petition now, and get attention to this matter! Talent like this doesn’t come often! Let’s start a petition! Hi Amina! Great idea. I was thinking to start a petition on change.org. I will do that later today InshaAllah! Eh, I need a better explanation than that from FIBA. Pingback: Talk Sports Media ® - Where fans go to Talk Sports. Join the conversation.